I’m feeling rather nostalgic this summer. After holding onto my Grandma’s estate in West Virginia for twelve years, my mom and her siblings are finally cleaning out the house and getting it ready to sell. Some of my best memories come from my Grandma’s. Grandma, Mom, and my aunts did most of the work in the kitchen, but we always got to set the kitchen table for dinner, and she kept a five-gallon bucket full of homemade cookies under the table for when we finished eating! I also had the special job of helping Grandma skin the boiled chicken before she fried it. For years everyone coveted Grandma’s fried chicken recipe, but she would never give any hints to the ingredients. A year or two after Grandma passed away, my Aunt Mary revealed her secret recipe. I can’t divulge that information, but after years of practice, I can almost make it as good as Grandma. Kids weren’t allowed in the garden, but that didn’t mean that we didn’t have garden chores. We would have contests on the back porch shelling peas and “snipping” green beans, competing to see who could fill their bowl first. We also picked blackberries and wild raspberries and blueberries for ice cream, cobblers, and jams. The blueberries we picked from “up in the alley.” If the grandkids ventured out on our own, we had to stay on the path. Being coal country, there were too many snakes and sink holes in the fields to go exploring without the grownups. We never minded too much since the berries were plentiful, and wild mint grew along the alleyway. When our parents went, we were allowed to wander the fields until we picked gallons of berries. I used to spend at least two weeks with Grandma every summer. I remember one morning coming to the breakfast table to find a bowl with a slice of toast in it. When my teenage, Lucky-Charms-eating self asked what it was, my grandma replied, “Breakfast. Do you want milk or tea over it?” With that, I was introduced to milk toast, or tea toast, whichever you prefer. My mom’s parents were Depression Era farmers who made do with what they had. Everything was used; nothing was wasted. If the humans didn’t eat it, the animals did, or it was composted to feed the garden. In fact, many of my memories of Grandma’s house revolved around food: planting it, harvesting it, preparing it, and eating it. It’s from these ethics that many of our favorite recipes were conceived. My father-in-law says we live in a world of excess. He claims that kids my age (anyone under the age of sixty-five) don’t know what it’s like to go without, so we have become wasteful. Maybe that’s the reason many of the foods we ate as kids are so hard to find. One of my favorite new/old recipes is watermelon pickles. My grandma loved watermelon pickles. Even so, I had never tasted them before. This year, since Grandma is so much on my mind, my eleven year old daughter, Helen, who is Grandma’s namesake, and I decided we would try to make some. Even though my hand ached from cutting the hard, green rind from the white watermelon flesh, the results were worth it! Now I understand why Grandma raved about them! Watermelon pickles combine the sweetness of the sugar and watermelon with the tartness of the vinegar to make a sweet and tangy treat. The recipe calls for half pint jars, but I can them in pint jars. I have to because otherwise I would eat the whole jar by myself. They can be offered as a snack, chopped as a relish, or put on the lunch or dinner table as an actual pickle. Cut pink flesh from watermelon and set aside for another use (like feeding to your kids!). Remove and discard green outer rind and cut white part of rind into bite size chunks. Measure 9 cups of rind with enough water to cover rind (about 6 cups of water) and the pickling salt. Cover and let stand overnight. Rinse rind under cold water; drain well. Transfer rind to large saucepan, cover with cold water, and bring to a boil. Reduce heat and simmer 20-25 minutes until rind is tender. Drain. While rind is draining, combine sugar, vinegar, water, and spices in saucepan. Boil gently, 10 minutes. Add rind and return to boiling; reduce heat. Simmer 25-30 minutes until rind is almost translucent. 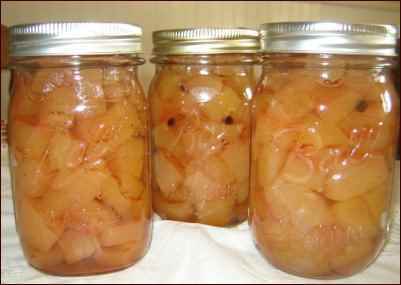 Pack rind and syrup into ½ pint or pint jars. Wipe jars and adjust lids and bands. Process in a hot water bath canner 10 minutes. Makes 6 half pints or 3-4 pints. Another kind of pickle that has disappeared from many dinner tables is the bread and butter pickle. Any well-stocked canning pantry is not complete without them. Many country kids grew up with bread and butter pickles on the table as a side dish and a condiment. Unfortunately, many younger families have forgotten about this delicious recipe. There are as many different bread and butter pickle recipes as there are gardeners in the United States. One of my favorites is my mother-in-law’s recipe. The pickles have a bit of a crunch and keep their dark green appearance. They are as beautiful in the jar as they are delicious on the plate. Slice cucumbers into ¼ inch slice with crinkle cutter. Thinly slice onions. Combine onions and cucumber slices in a large bowl. Layer with salt and ice cubes. Let stand until ice is melted, about 2 hours. Drain mixture and rinse well. Combine sugar, spices, and vinegar in a large saucepan. Bring to a boil, add cucumbers and onions, return to boiling. Boil 3 minutes. Ladle hot pickles into pints jars. Wipe jar clean, adjust lids and bands, and process in a hot water bath 10 minutes. Makes 7 pints. Growing up in the 1970s, many families were on tight budgets. Even though we didn’t have a lot, we never missed what we didn’t have. My mom and dad always had a garden, even if it meant bartering with a neighbor for a plot of land. Mom was great at stretching her food dollar, and there was always plenty to eat. Tomatoes were a staple at our table. Home-canned tomatoes were used in chili, stewed alone or cooked with zucchini as a side dish, made into sauce, or added hot to elbow macaroni. Quarter and slice zucchini. Combine zucchini and tomatoes in saucepan. Heat just to a gentle boil, stirring often to make sure bottom does not burn. Turn heat to low and simmer until zucchini is tender. Add butter and salt to taste. In a saucepan, bring water to a boil; add macaroni. Stir. Return to boiling, stirring occasionally. Boil 3-5 minutes until macaroni is tender. Drain. In saucepan, heat tomatoes until warm. Add macaroni and butter. Heat through. One of my mom’s guilty pleasures has always been stuffed banana peppers. I have never been able to grow my peppers large enough, but Dad would never consider picking his until they were at least as big as a hot dog. Lucky for Mom, my sister has the knack for growing hefty banana peppers. They make festive and mouth-watering Christmas presents. 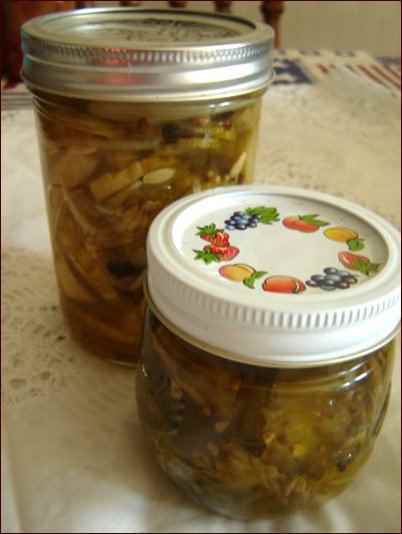 This recipe has been passed through our family for so many years, the amounts for the recipe have been shortened to “make as much as you have peppers in the garden.” For this reason, I have included the amounts per quart jar. Adjust the ingredient amounts for how many peppers you have available. To process a full turn, or seven quarts, you need 35 peppers and 35 hot dogs. Smaller, “normal” sized hot dogs work better than the larger plump hot dogs. Since the hot dogs swell somewhat as they are processed in the hot water bath, using smaller hot dogs prevents the peppers from splitting. Cut tops off peppers and remove seeds and membranes. Stuff hot dogs into peppers. Place 4 to 5 stuffed peppers into each quart jar. Heat your favorite tomato sauce and fill jars to cover peppers. Wipe jars clean. Adjust lids and bands. Process in a hot water bath 45 minutes. A couple years ago, Andrew Zimmerman was patrolling the hills of West Virginia on his show “Bizarre Foods America.” Being a Mountaineer through and through, I will watch anything that has to do with my “Home Country.” One of the delicacies presented was corn cob jelly. Zimmern proclaimed that the recipe showed the resourcefulness of the mountain people. This was not new information for me. After asking around, I found many West Virginians that fondly remembered their grandparents making this treat. 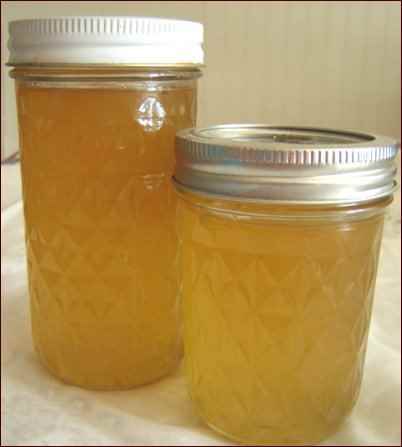 Another name for this jelly is West Virginia Honey because it has a golden appearance and smells and tastes much like honey. Best of all, it recycles something that most people throw away. My family usually goes through quite a lot of corn every year. I take cut the kernels off the cob to freeze for winter dinners. The cobs are then boiled to make jelly, and finally, the used cobs are given to the chickens to pick clean. Once again, this is one of those recipes that have been passed down to use whatever you have on hand. It is adjustable to the amount of cobs left over after the kernels have been removed for other uses. Combine corn cobs in large stock pot with 2 quarts of water. Boil hard 30 minutes. Remove from heat and strain liquid into measuring cup. Discard corn cobs. Measure 3 ½ to 4 cups of liquid in pot with lemon juice and pectin. Bring to a boil. Add sugar, equal to the amount of measured liquid. Return mixture to a rolling boil, stirring to dissolve sugar. Boil hard 1 minute, stirring constantly. Remove from heat. Ladle hot jelly into half pint jars. Wipe jars clean, adjust lids and bands, and process in a hot water bath 10 minutes. Makes 5-6 half pints. My husband and I are trying to raise our kids with our grandparents’ ethics. We grow as much of our food as possible, buy our meat from local farmers, raise our own chickens for eggs and meat, and try not to waste anything that we can reuse. We are teaching them how to preserve food for winter and to make do with what we have. As for missing my Grandma, I do have her sewing machine and her every day ironware dinner plates that she gave me before she died. My dream would be to have her old kitchen farm table and chairs too, but I know I can keep her alive with her recipes and the stories I have to tell my kids. Hopefully, my kids will one day tell my grandchildren about my how much I liked watermelon pickles or my secrets to fried chicken and homemade mac and cheese.